Japan had done little with the new idea of paratroopers in the 1930s, but perceived German successes with them in 1940 encouraged her and many others to develop them much more quickly. However in the end they were little used for drops into combat, with only a handful of operations early in the Pacific War, and a couple of commando raids in 1945 which achieved nothing of note. The great rivalry between the Imperial Japanese Army (IJA) and Navy (IJN) caused both to develop their own paratroop forces, largely independently, and both have previously been modelled in this hobby. Here we have the IJA version of the species, complementing the earlier Navy version from Strelets. IJA paratroopers dropped into combat wearing normal Army uniform with a smock covering it and most of their equipment to prevent snags which could be life-threatening if they disrupted the jump. Once landed, the men would discard the smock and fetch the weapons dropped separately in order to begin the fight. 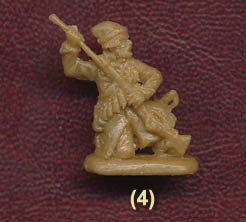 All but two of the figures in this set wear the smock, or rather, an approximation of it. Early on the IJA experimented with sleeveless smocks, but apparently only actually went into action with full-sleeved smocks that had fastenings on the bottom to fit snugly round the upper leg. This has been accurately depicted on the box artwork, but it is pretty clear that the figures themselves have a sleeveless version. Now to a large extent this can be concealed by a suitable paint job, but technically they are wrong. What is more to the point is all but two of the men are wearing them in action, when they would have been discarded early on. Added to that, they have attached their full kit outside the smock, removing the point of the smock in the first place. In this regard the box too is misleading, but sadly the evidence suggests all these figures are incorrect, though it does at least distinguish them from ordinary Japanese infantry. The kit of such men was much the same as for the rest of the Army, and generally has been well done here, with reasonable pouches, haversacks and the rest. Several have packs on their back, which screams out that these men have not jumped anywhere, since they certainly did not jump with such things. However if they have not jumped then why would they be wearing the smock at all? Many have one or two bandoliers – a popular paratroop accessory, though Army paratroopers usually wore them round the waist rather than the chest – and the kneeling figure second from left in the third row has a long item in a bag on his back which we could not positively identify (a light mortar barrel perhaps?). Finally the officer has a pistol holster, water bottle and binocular case, though we might have expected a map case too. Weaponry is 50% rifles, probably the standard infantry short rifle, though detail is unclear. Surprisingly four carry submachine guns with a straight magazine on the left side. Such a weapon also appears in the earlier Strelets IJN set, and it gives us concerns here as it did in that set. The Japanese used very few submachine guns, and apart from a tiny number of foreign imports the only such weapon to see anything like widespread service was the Type 100. However this had a curved magazine, not the straight one depicted here, so once again we cannot say what this weapon is (presumably some foreign import, though we don’t think the Army got hold of the SIG 1920 model, or perhaps a deliberate 'fault' as the curved magazine could not easily be modelled). Whatever it is, it is massively over-represented here, even for the last year of the War, and certainly for when such men were actually jumping in 1942. The officer has sword and pistol, and there is a prone machine gunner with a fairly crude machine gun that has a side magazine, which suggests this is a Type 11 model with its unsatisfactory side hopper. The style of these figures is very much in the old tradition of Strelets, with a heavy, lumpy look to them. Some smaller and thinner details such as bayonet scabbards are much larger or fatter than they should be, so the overall impression is fairly basic, though most of the detail is actually there. In this case at least the basic quality does not extend to the making of the mould, for there is no flash anywhere on these figures, and the chosen poses mean there is no unwanted extra plastic either. This does have the effect of making some of the poses rather flat, such as the man bayonetting, although this is one of several poses which we actually liked. Bayonetting was hardly a common occurrence in World War II of course, but the high number of figures (half of them) not standing up is good to see, and all that are standing are at least on the move, so really no poses here are a waste, and on the whole all are well thought out. There is no evidence that paratroopers wore their smock when not jumping, yet many here do not look like they have jumped anywhere, festooned with luxury kit like packs, and in any case such items were not put on over the smock, so some fairly basic accuracy problems here, which give the impression more of confusion in design than poor research. The sculpting means these do not work well with figures from other manufacturers, and while the poses are really good, the high number of submachine guns is both inappropriate and of a design which seems to have been seldom if ever actually carried in the field. As a result this is a disappointing set which is significantly inferior to the equivalent set from Ultima Ratio.